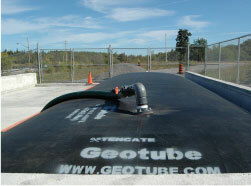 Since April of 2008 the Township of Bonnechere Valley, located in Eastern Ontario, has operated a Nutrient Management Facility which utilizes the Geotube® dewatering Technology as its primary method of biosolid and septage management. 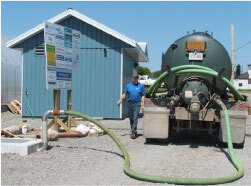 Since the implementation of the facility, the township has completely elimanated the need to transport biosolids during the winter months, as the Geotube® units provide enough additional storage capacity that the material can be left inside the bags through the winter and disposed of on approved farm land when the farmer needs it most. The additional storage capacity also serves to generate a revenue for the township. 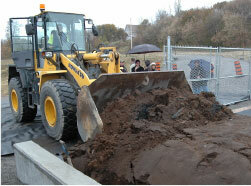 Neightbouring municipalites now dispose of their biosolid waste at the facility, as opposed to trucking it to Ottawa during the winter months. Bonnechere Valley Township no longer land applies any liquid biosolid waste, but a dewatered, odorless material similar in appearnace to black earth. To learn more about the Bonnechere Valley Township Nutrient Management Facility click here, or check out the video below.